Today we welcome the incredible Kiki Hamilton. 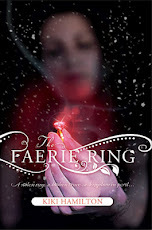 Kiki Hamilton is the author of the YA historical fantasy series THE FAERIE RING. 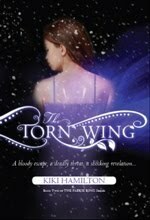 Book 1, THE FAERIE RING and Book 2, THE TORN WING are both out now. Book 3, THE SEVEN YEAR KING releases in May of 2013. Thanks for inviting me over to STEAMED! Though I’m not a writer of steampunk fiction, I do write historical fantasy (THE FAERIE RING (2011) and THE TORN WING (2012) )which has some notable similarities with steampunk, such as life in the Victorian era. One of the questions I’m frequently asked is how much research do I have to do for my books? The short answer is A LOT! The longer answer is that I do spend quite a bit of time researching Victorian England, as well as British faerie lore, but luckily, I find it fascinating. The goal of any writer who sets their story in the Victorian era is to make the reader feel like they’ve stepped back through time (or taken a time machine…) and are walking the foggy, cobblestone streets of the past along with the characters. How does one accomplish that? Hopefully, the reader can see the interior of the pub, along with the patrons, can smell the spilled ale, can hear the notes of the piano and feels immersed in this world. This is a critical part of any story. Characters need to be described in a way that is suitable to the era. Character definition is an opportunity to further immerse the reader into another era. Dress, language, backstory and motivations each play a part in creating a mental image for the reader. Tying each of those to the time period reinforces the setting and mood you’ve established. For me, this is one of the most enjoyable parts of writing THE FAERIE RING series – finding ways to weave actual history with the fantasy story I’m telling. I like to think of the books as ‘what if…’ stories which is similar to the alternate timelines that many steampunk novels employ. Using language that is suitable to the timeframe is an important piece in creating the world of your novel. Using language or terms that are too modern for a Victorian setting (anachronistic) is one of the fastest ways to pull your reader out of the ‘dream’ and remind them that they’re reading and not living your story. So, that’s a quick look at some of the considerations I put into writing historical fantasy. Hope you found it interesting and helpful! Any others we should add to the list? First off, we have some winners to announce. Congratulations! Email me at suzannelazear (@) hotmail to claim your prize. Now, on to Book Monday. 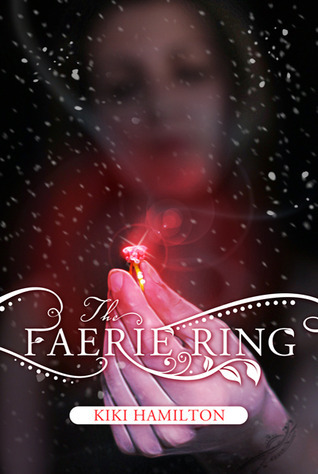 I have a huge soft spot for young adult faerie books, since I write about faeries. I have an even larger soft spot for Victorian faerie stories. This book didn’t disappoint me one bit. Hamilton skillfully combines faerie lore with Victorian London weaving together an enchanting tale of magic, mystery, and mayhem. Tiki is a teen-pickpocket living with her “family” of orphan thieves, including little Clara, who’s often sick. When Tiki steals a ring from the palace she thinks first of Clara and how the ring could buy the medicine they need for the littlest and frailest member of their band. Only the ring Tiki stole binds the treaty between the royal family and the fey. Away from the safety of the palace, the ring–and Tiki–become a target. If the ring is destroyed then the treaty is broken and the fey can do as they will, probably at the cost of mortal London. 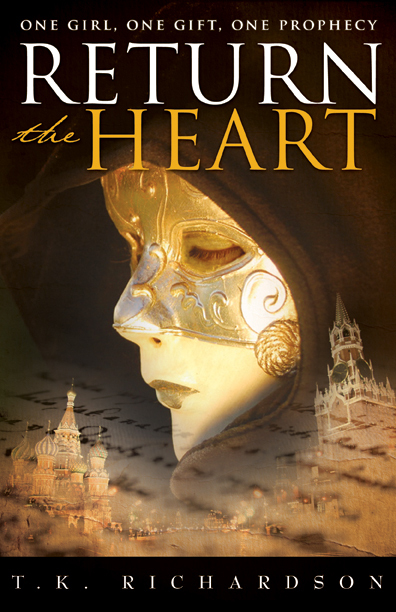 In order to save the treaty–and humanity, she must figure out who to trust, which includes the handsome rascal Riecker and the young Prince Leopold. This fast-paced action-packed story is full of twists and turns that had me glued to my chair. I fell in love with Tiki from the very beginning. She’s plucky, and resilient, and even though life hasn’t dealt her the best hand, she’s not bitter, rather, she rolls with the punches and does what she needs to do to survive–and protect her family. I love how loyal she and the other orphans in their little band really take care of each other — even little Clara. Hamilton’s version of Victorian London comes alive–complete with the grit, despair, and poverty all-too-common in that era. However, thanks to Tiki and her resistance, even when the story gets dark, there’s always a glimmer of hope. It’s also quite fun to journey through London with Tiki–from the streets of London to the palace and thanks to the brilliant descriptions you feel like you’re *right there*. Again, I loved the way Hamilton seamlessly melded faerie lore–and even Gaelic–into her Victorian world. Like in faerie lore, these faeries aren’t always nice, especially those of the dark court. There’s something for everyone in this story–a little historical fiction, a little romance, a really good story, faeries, action, and mystery. I highly recommend this to anyone who’s a fan of either faeries or Victorian stories. Since I love this story so much and am going to buy a final copy, I’m going to give away my ARC. All you have to do is leave me a comment and tell me what sort of faerie (dark or bright) is your favorite. Contest open internationally, ends October 9th, 2011, at 11:59 PM PST. Today we have Jane George, author and illustrator of the YA book, The Mumbo Jumbo Circus. As a kid, I was exposed to such imaginative oddities as The Wild, Wild West TV show and The 7 Faces of Dr Lao. These kinds of cultural influences wax and wane, and now the lure of the mysterious, the impossible, and the forbidden is stronger than ever. The resurgence of interest in circus arts, sideshow and burlesque theater may be part of the same cultural backlash to beige-box consumerism that spawned Steampunk. Humans crave color, imagination and creative freedom. In Austin, Texas, The East Side Show Room serves up gourmet cuisine and vintage cocktails with a side of cabaret in a steampunky-circus atmosphere. For a Tim Burton meets the circus experience, there is Cirque Berzerk in Los Angeles. And in San Francisco you can have, “Love, Chaos & Dinner,” in a tent with Teatro ZinZanni. While the delights of classic roadside attractions like The Thing are now few and far between, there are performers who are carrying on the tradition of Sideshow and the Ten-in-One. Austin, Texas is also home to Noel Benedetti aka Ballyhoo Betty, a sideshow performer who specializes in fire arts. Noel is blogmistress of www.HeyRubeCircus.com , a fantastic celebration of all things circus and sideshow. 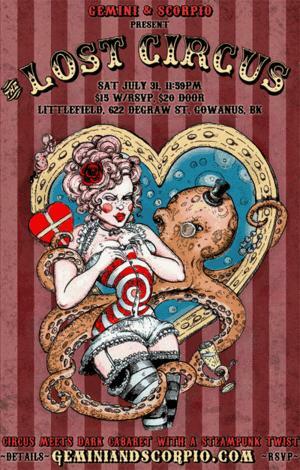 She is affiliated with 999 Eyes Freakshow, The Invisible Man Corporation, and The Surreal Sideshow. 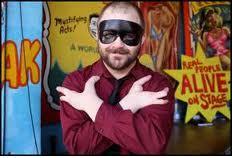 Noel suggested I look up a visual artist and sideshow performer named Jason Black, aka The Black Scorpion. Among the venues he performs at is Coney Island’s Sideshows by the Seashore. He, born a naked baby boy with irregular hands, unlike any other. When him you see, understand you will. Witnessing his Anti-Act is the longest day you will ever live. Remember he is breathing for something onstage, and living the rest for his life. That last line stays with you, doesn’t it? I’ll bet his act does too. Current circus and sideshow acts could be be said to be more about individualism and creativity than about “Hey, Rube” hucksterism. This is especially true in the modern world of burlesque. A revival in burlesque and the art of the striptease happened in the Nineties and has been gaining in popularity ever since. Partly driven by a nostalgia for old-time glamor, modern burlesque is also a feminine reclaiming of the “male gaze,” often in intelligent and hilarious send-ups of the medium. Burlesque is theater, cabaret and performance art rolled into one. Hot Pink Feathers is performing a Sally Rand-type showgirl routine, with feather fans and dripping-pearl bikinis, in San Francisco’s Carnavale Parade on Sunday, May 29. Say hello to them at the staging area 9am-12 at Bryant between 21st & 22nd. Parade starts at noon. They can also be seen on the 2nd Saturday of every month at Café Van Kleef, where they perform with the Blue Bone Express brass band. Next show is June 11. 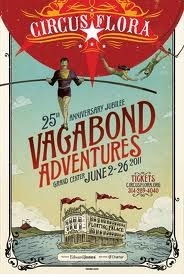 For a while now, circus arts have been making their way back to the more intimate, single ring circus. When I saw an equine show produced by Cirque du Soleil called Cheval Theatre, I could practically reach out and touch the horses. I definitely felt the whoosh as they galloped past my seat. A circus dedicated to this connection between performer and audience is Circus Flora in St. Louis. Circus Flora weaves a theatrical storyline through their classical circus acts. From their site, “The artistry, magic and charm of Circus Flora’s performances have made it part of the vanguard of the “new circus” movement in North America.”The artistry, magic and charm of Circus Flora’s performances have made it part of the vanguard of the “new circus” The theme of their performances changes annually. This year it’s a Victorian-era riverboat theme entitled Vagabond Adventures. That quote could have been written about my recently-released, young adult fantasy, The Mumbo Jumbo Circus. It describes the themes of my novel perfectly. One random commenter will receive a paperback of The Mumbo Jumbo Circus. Step Right Up! into the world of human possibility that is this writer’s imagination. Freedom, creativity and individualism are hallmarks of modern sideshow, burlesque, cabaret, and circus arts. Just like the relationship between author and reader, the magic is in the point of connection. I like to think of a circus ring as a sacred circle of human possibility. Happy performing, in whatever you do! What do you love most about the circus? 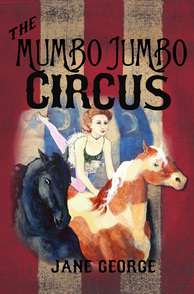 Jane is giving away a copy of The Mumbo Jumbo Circus to one lucky commenter (North America only please). Contest ends 11:59 PM PST June 1, 2011.